Waukeela is located in one of the most beautiful outdoor spaces in the world! We take advantage of our own backyard by offering fantastic hiking, camping, canoeing and climbing trips for our campers. Whether your daughter is a skilled outdoors woman or experiencing her first camping trip, she will come home with a new appreciation of the great outdoors. Each one of our campers will get the opportunity during the summer to hike in the beautiful New Hampshire White Mountains. We offers hikes for all ability levels to beautiful waterfalls, swimming holes, and unbelievable New England views. For campers interested in overnight backpacking, we teach orienteering and camping skills for an experience like no other where campers can sleep right under the stars. A summer at Waukeela isn’t complete without spending a few cool, relaxing nights under the stars! Waukeela offers outdoor camping to those that wish to develop knowledge of the land, as well as outdoor skills that could benefit them later in life. We believe in the importance of girls feeling safe in the natural world, while learning to respect the nature around them. 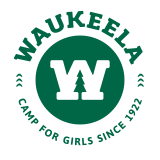 Not limited to simply sleeping in a tent, Waukeela teaches the basics of fire-building, outdoor cooking, navigation, plant identification, and orienteering. We believe that there is no end to the fun that could be had out in the wilderness! Canoeing is a Waukeela tradition and all of our campers go on a flatwater or whitewater canoeing trip during the summer. The rivers and lakes of New Hampshire make for the perfect place for campers to practice their strokes and improve their canoeing technique. Senior campers who want to try their hand at whitewater canoeing can go on a trip to the Androsoggin River, where they can sleep under the stars and spend their day exploring the River. Rock climbing is quickly becoming a favorite activity at Waukeela for campers who love to soar to new heights! Our campers have the opportunity to participate in two climbing trips each session where they can climb, belay and rappel on an actual mountain face! Rock climbing is a great way for our campers to learn new skills, face their fears, and try something new.